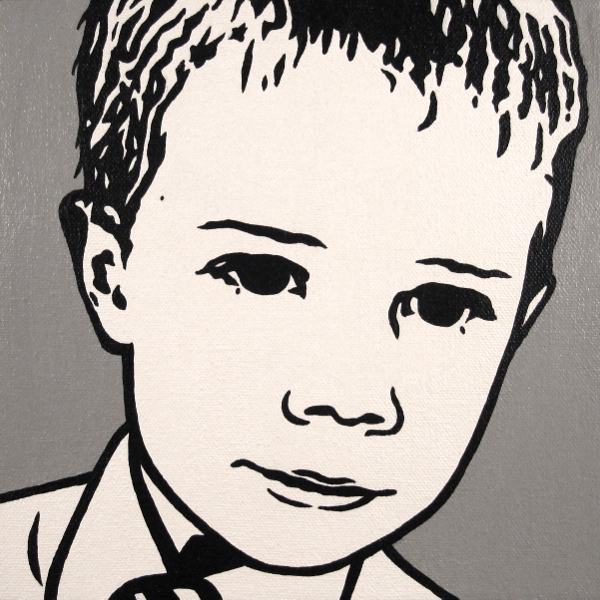 Whether you are a proud parent looking to get a unique portrait of your child/children, or are searching for a special baby shower gift idea for a loved one to celebrate their growing family… these fun minimalist style black and white Kids Portraits work in any style of home and are available in any custom background colour. From a photo for reference, I crop it to a square composition, sketch a contour line style image focusing on the facial outline and key characteristic features, then paint the positive & negative spaces in b&w. Then the background offers that pop of colour, whether you’d like it to coordinate with your decor or reflect your child’s favourite colour, any shade is possible. 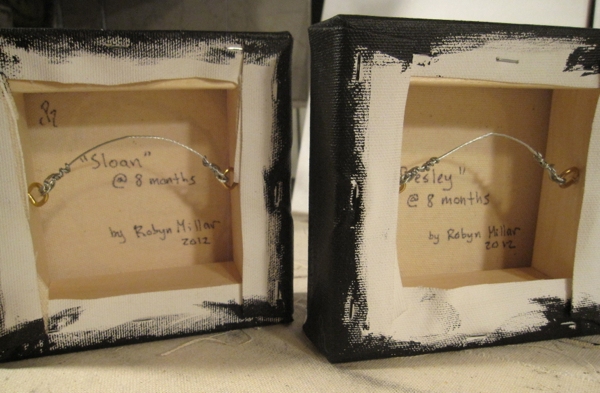 All paintings are complete with finished edges and wire hardware, so they are ready to hang frame-free! Due to the relatively small scale of the canvases, they are also able to stand on a shelf or a picture ledge if you prefer that over hanging. All portraits are signed on the back, titled by name (and optionally the age marker as well), and dated with the year the painting was completed. As not to distract from the simplicity and contemporary look of this style of portrait (and let’s face it, the cuteness of the kidlets!) I subtly paint my logo on the bottom corner of the right hand facing edge of the painting instead of of the front. Grown up portraits are possible too so creating a unique family portrait collage is definitely an option! The canvas edges are painted black unless specified otherwise, but alternative colours are possible by request (eg: white). 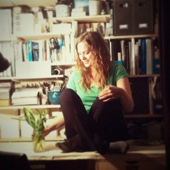 Reference photos for these portraits don’t have to be high resolution to work out great, so you can even submit quick snaps from your phone, grab a pic off of your facebook photos, and so on. Not a big fan of square canvases? We can do a rectangle instead no problem. 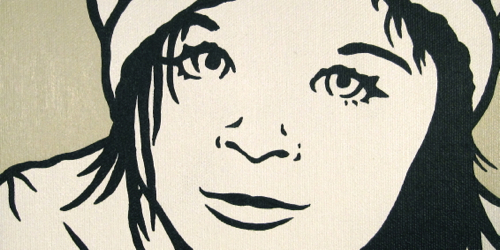 Would you like multiple portraits on one canvas? If so please email pictures so I can confirm if this is possible, and to suggest possible canvas sizes / prices. Order time is approximately 3 weeks (plus shipping time if applicable). If you would like further info, or would like to request a quote, please feel free to get in touch HERE. To view more examples of Kids Portraits, please visit my ‘For Kids’ portfolio page HERE. Love your minimalist kids portraits. You painted “Ace” the border collie for me a few years ago, and now my nephew and his wife are expecting their first baby. Have been thinking about a kid portrait as a present. How much do you charge? 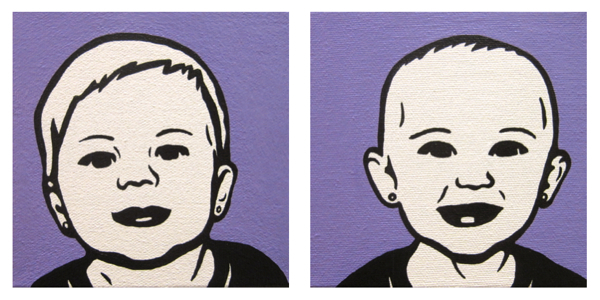 I’d love to paint a minimalist style ‘Kids Portrait’ for you. The pricing depends on the size of the canvas and can go as small as 5″x5″. Gift certificates are also available if you’d like your nephew to select the photograph they’d like to use etc. The possibilities are endless really, so I’m sure we can find the perfect fit!